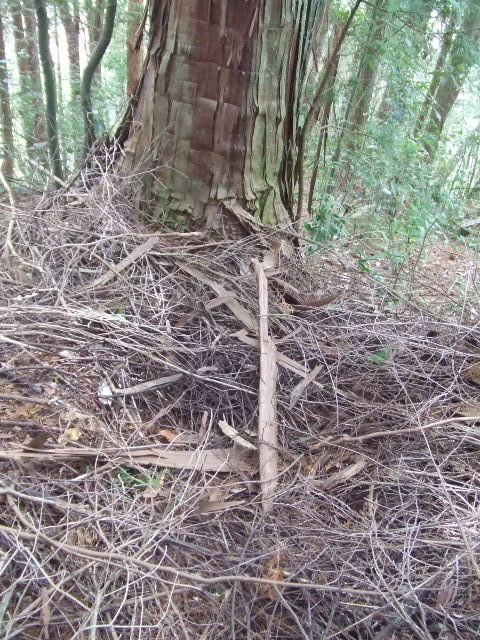 I have a good tiedyer friend who passed on into the blue yonder just a while back, and have had the good fortune of having had a certain amount of his remains entrusted to me for enshrinement here in Japan, on the mountain out back. And this morning we took him up the mountain, my boys and i.
I told them about Michel on the way up, how he touched a lot of people through his posts on FB and through his tie dye even though he had never met so many of them in the flesh. I thought of his almost daily posts, mandalas, poems, rants, witty comments and observations, entreatments for a sale so he could buy Mt Dew and other necessities of life. He was a big part of my life, like a brother, and his sudden departure echoed across months, even now. So we went up the mountain to a shrine almost at the top. There is a large outcropping of bedrock along the front face of the mountain, and one large boulder has broken loose and split in two. Legend has it that a certain earthquake split the rock over a hundred years back. 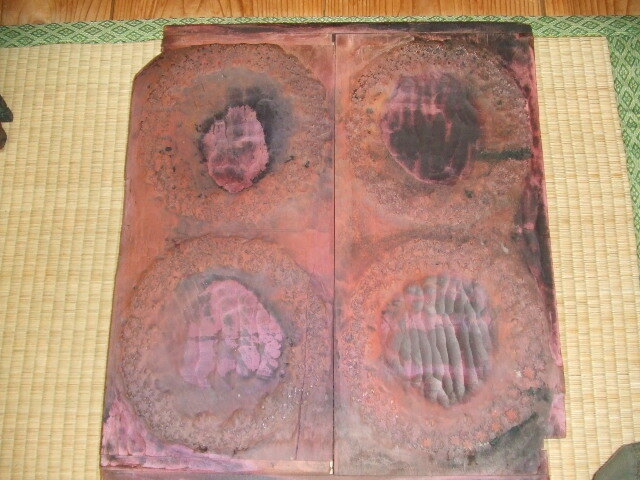 Now, the space created under the two pieces is revered as a Shinto shrine, with deities and offerings. This was the first place that i had planned to enshrine my friend. So i reached down and found an appropriate piece of wood which i used to scoop a small amount of the remains from the bag and then set them on a rock in front of the shrine. No sooner had i set this bit down, not a second after, a temple bell tolled somewhere from below, clearly, once. The timing could not have been better. A temple bell, and it must have been a large one, because the tone was low and carried long. I do not even know of such a bell in the area, and i tend to know the temples which are around. I have never once heard such a bell from my house below, and i have been here for 12 years now. I looked up, surprised, at my boys, who were staring back at me in disbelief. 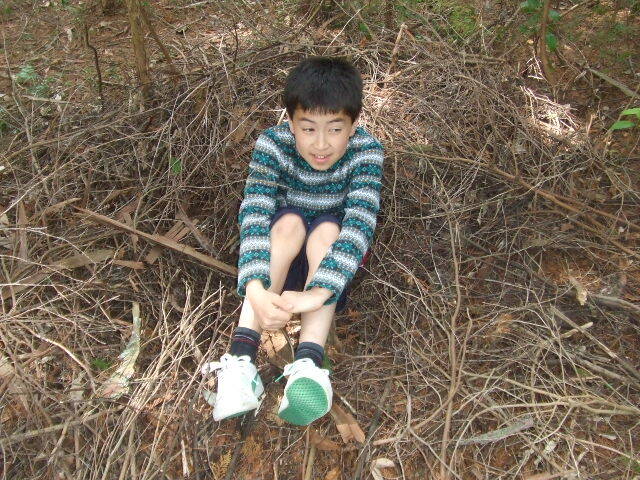 My younger boy let out a nervous laugh, and remarked it was scary. The japanese people are very superstitious , especially about things surrounding death. But I was happy to hear the bell. For me, it was loud and clear, purely an affirmation. Michel was where he should be. After this, I moved away from the shrine somewhat to a cliff area, a lookout ridge that faces south over the expansive bowl of civilization, towns and buildings. It was where i had planned to leave my friend to rest, a place with a view, a look out spot, able to take flight in his astral journey through parallel planes and lands we can only dream of. And i placed the rest of him there. 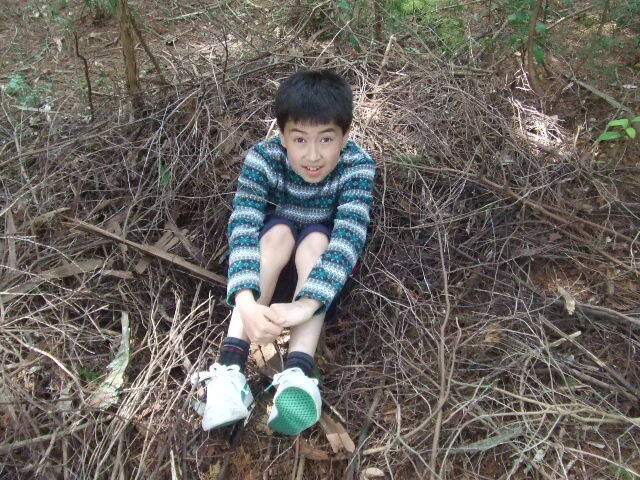 It was out on a cliff, off the beaten path, and on our way back to the shrine from there, my boy exclaimed and poimnted at my feet. 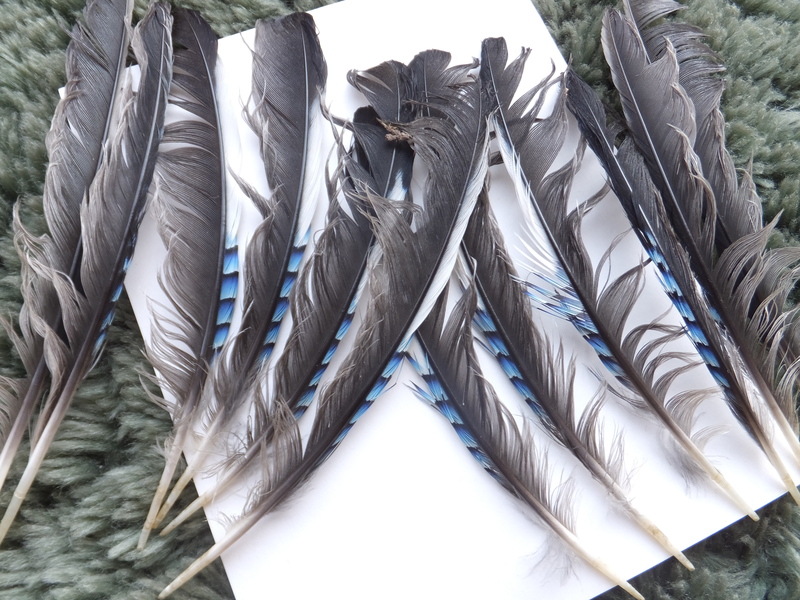 Down below there were feathers strewn across the pine needles, feathers adorned with blue and white stripes. The gift, the thank you, balancing out. It’s comin’ up on that time of year! That time that I look forward to, going on over to Glennis’ in California to teach together with her. Link below. 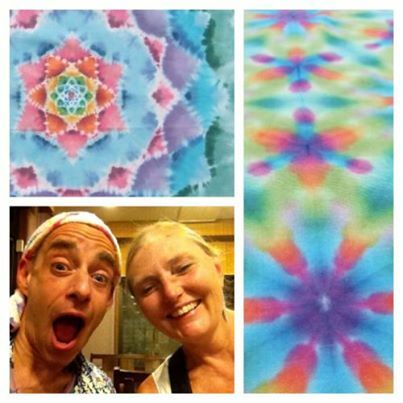 This year, we are teaching BOTH mandala shibori AND itajime techniques in a three-day course. Mandalas basically being circular patterns which display different magnitudes of symmetry. Itajime shibori is an ancient japanese technique, but I initially approached it for a different reason. For me, the initial attraction was the fact that it is also repeated mandalas, if you look at it that way. And also the fact that Japanese width fabric lends itself so perfectly to such a technique! 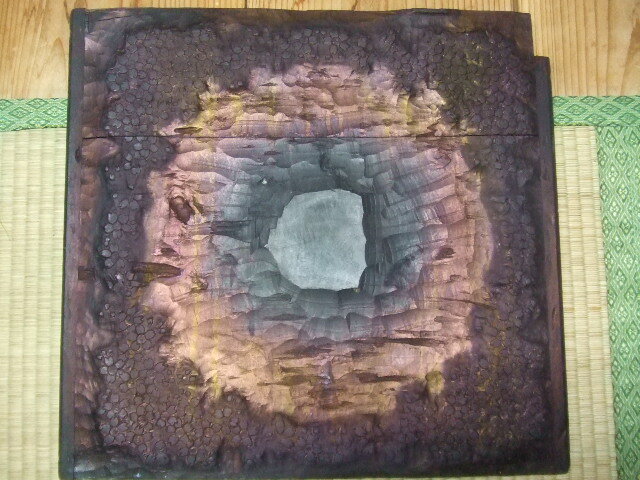 Today, I completed this panel which combines both techniques in one work. The central mandala is 6 points in the middle, doubling to 12 points partway thru. Anybody who knows me and my work knows I love and prefer 6 and variables thereof, like 12 and 24. 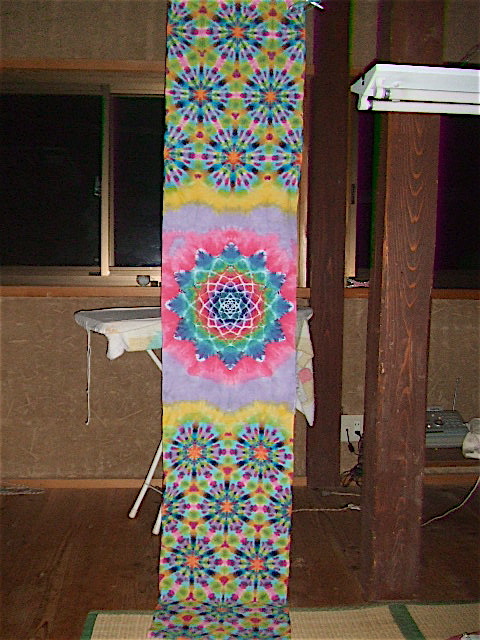 Six is displayed in nature in crystals of ice, and elsewhere, and the 12-point mandala surrounded by six-pointers seen in the itajime pattern (hard to make out clearly with this one, too many colors) is a basic representation of the structure within certain energy flow models. Sacred geometry, baby! Check it out! This was surprising, took me a bit to figure out what we were looking at. I was really dumb-founded at first. For some reason, I was thinking deer (lots of deer pellets in the mountains all around my house recently – that’s a new development, new to the past few years)…..but then I would think, “no way deer could construct such an intricate thing”….. So, I was walking up the slope with a friend the other day, observing stuff and havin’ fun, and we stumbled on this. A concave depression created of similar size branches, some soft bark, no doubt, a bed. A monkey bed!! Really well made, i was blown away by the mental process this entailed….really blown away….made the point that monkeys are really not far, or should I say we haven’t gone all as far as we seem to feel we have come, away from the animal monkey state……was kind of mind-blowing. What was also kind of funny was the fact that this monkey bed was surprisingly close to our own house, and even to the space where we ,as a family , sleep. 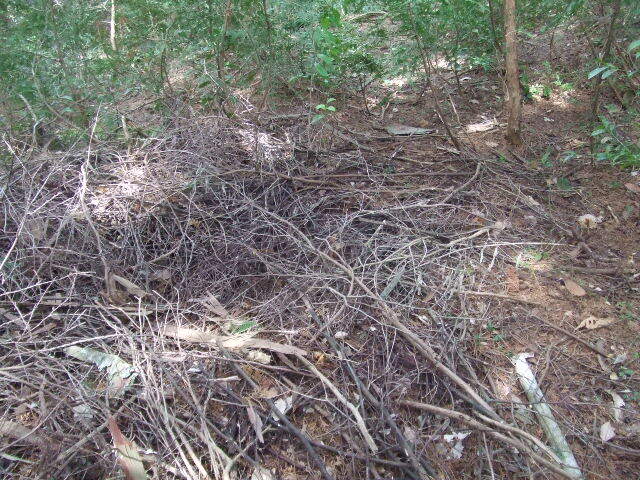 Because we sleep on the 2nd floor, and this nest was just up on the slope from our house, in reality, fifty meters or so, and sort of at the same elevated level. Really sort of made it hit home in a different way. Not only are the monkeys sort of like us, eerily similar, but they are even sleeping in the same area!! Kind of like it’s the quiet area where all we animals gather to sleep. Helps one feel like maybe they are a bit more “beastly” than we would like to imagine……. Hahahaha!!! Crazy monkeys……I wonder if they are there tonight, in th rain. I’m sure this nest helps them to stay elevated just enuf off the ground to stay a bit warm. I can imagine them all huddled and sleeping en mass…..
Uh….adddy?…can I get out now? OK, here it is. I’ve found it. It’s the difference. 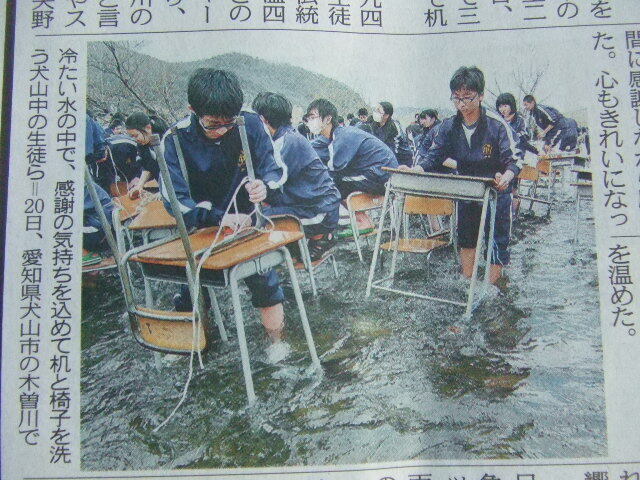 The difference between Japan and the rest of the world…..at least the world that I came from…..the US. This is it. The difference. Distilled out. In it’s pure form……. Sometimes, we come across diamond in the rough……this time, I think I may have hit it again! I go to antique shops, fairs….I’m incorridgeable! Well, this is a set of pieces that I found at one said antique shop which I frequent, in Mino, the city next to ours, known for it’s old town and paper industry. The walls of the cafe section of the shop are lined with these printing blocks, and they were always intriguing. Upon inquiring about them quite a ways back, I found that they were from an old napkin business in Gifu City, an hour downriver of here. And that there were more to be had! Gifu is a textile and paper area, so this made sense. This dealer had bought the whole lot, numbering in the hundreds. The company was printing personalized napkins for restaurants in Europe, and some of the plates had wholes to insert and change names. You can see one such plate which i got below. 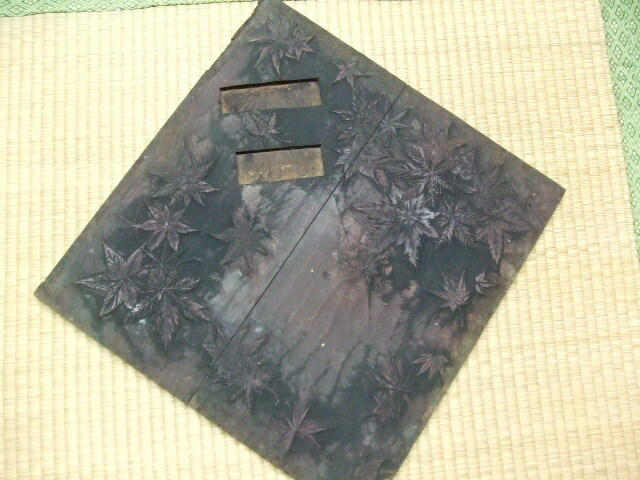 The plates were carved in the Meiji and Taisho eras and are well over 100 years old. One or two which still had the restaurant names left in had places from Spain inserted. Since the plates were used for printing, they all had printing inks left on them; some blue, some pink,evry color represented! But it just seems to make them more interesting, more bizarre and other-worldly. Each of these plates is remarkable on many levels, considering design, overall sculptural qualities and historical providence. Really something we may never have the chance to own again! (that’s right! You TOO could own one…squeeky wheel!) Please look at better photos of some of th plates at my Facebook page. Really, diamond in the rough….seed for wondering…..the beginning of a new episode in the life of an old object….. Skiing!! …well, it’s all relative…..
Was talking in the car the other day with my wife’s mom, and we were talking skiing. 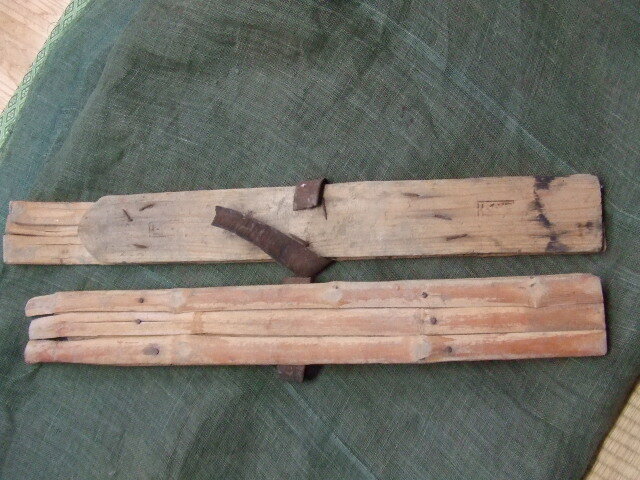 And Grandma told us about skiing when she was little, and that they had skis made of bamboo. I envisioned someone skiing on slices of thick, green bamboo, maybe the slices splayed out a bit to make them flatter…..I wasn’t sure, but imagined that skiing on bamboo skis must have been slick and fast! Then, about a week later, while I was putting something up into one of our storage areas, I made an amusing discovery. I have such a pair of skis!! 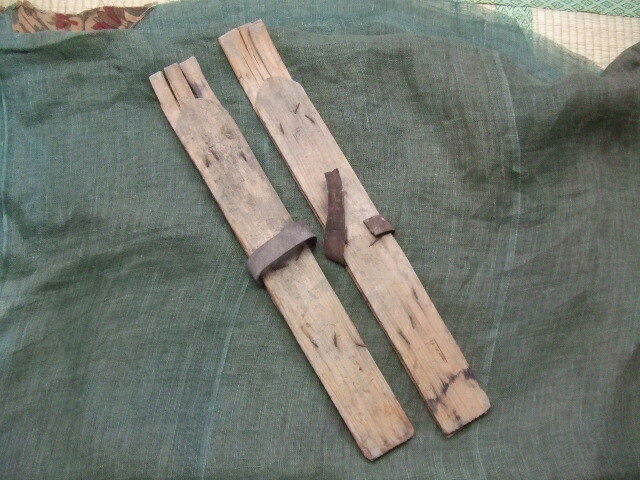 I love old wooden tools and devices, and I have picked up numerous things over the years here. Often there are interesting and intriguing pieces which I am not even sure what they are! 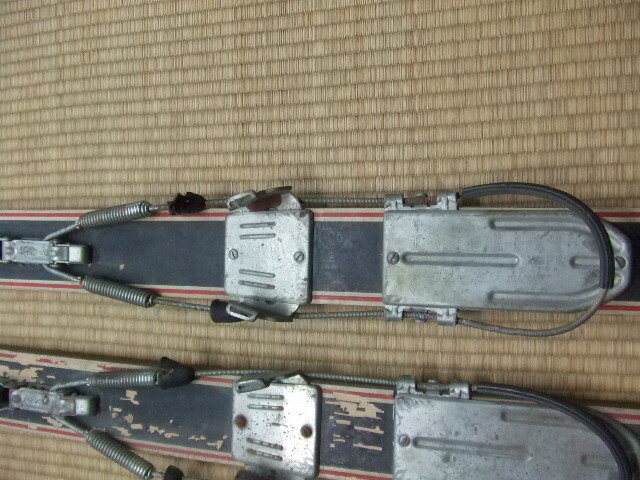 Well, sitting in an old rice hamper with lots of other long, thin tools was this pair of old skis! 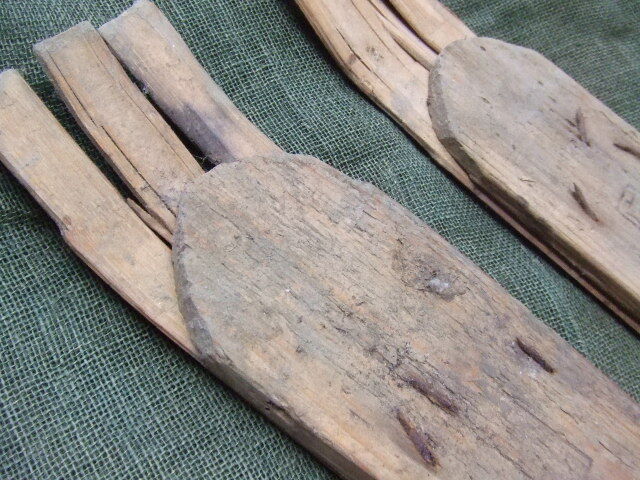 I had until now suspected that they were some type of snowshoe……but now I know!! Skis! These are skis! !…….everything is relative! 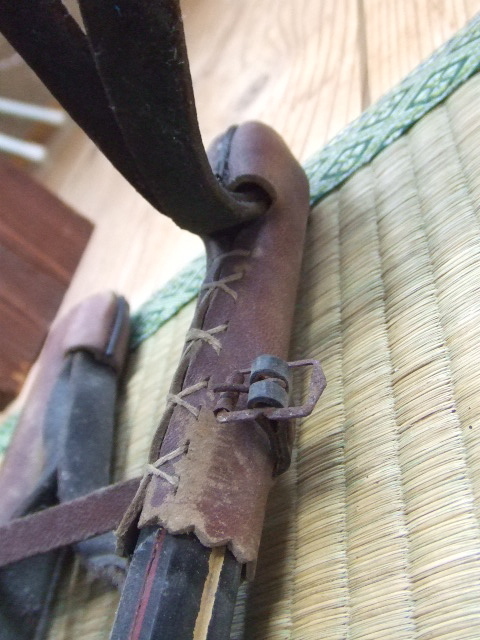 ….a wooden board with thin strips of bamboo nailed on underneath, leather straps to hold them in place……..!!! These originally came from the house we are living in b4 it was moved here, over in Fukui Prefecture, a snowy area. 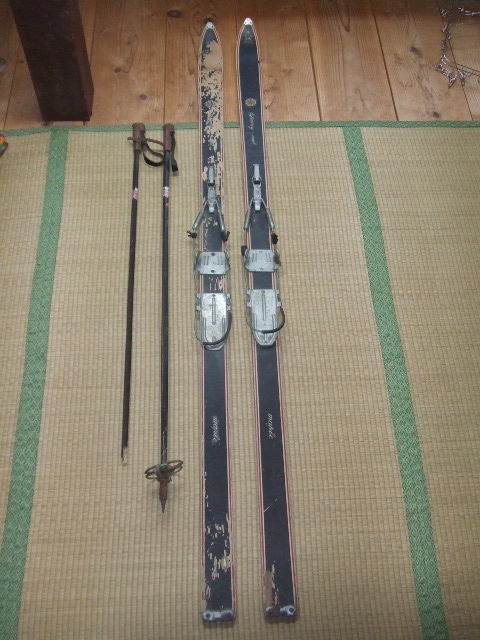 I have another pair of skis, also. Don’t even exactly remember wherer these ones came from, thy’ve been in my storage for aeons it seems…..
Again, proof that everything is relative……..
; ) The handiwork involved in those stocks, though, is outta this world!! Leatherwork, precision leatherwork!